Looking for an electric dryer for your home? You're in luck. Josh Mintzer, a partner in the group that owns the land where Ross Dress For Less and other retail will go in (918 W Montrose), as well as the former Borders/future First Ascent building, is holding a sale on new electric dryers this weekend, and quite a deal it is. 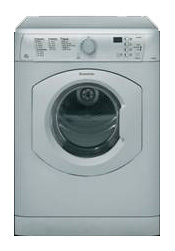 Brand new electric dryers from Ariston (which sell for $999 at retail outlets) will be on sale for $135/each. He has 100 of them in stock from another company he owns. They are new, in packaging, and have a 12-month warranty. Click on the link above for specs. The dryers' color is platinum. It's up to you to get it where it's going. Josh says, "The obvious issue is that there isn’t a matching washer, which is in large part why I’m offering such a steep discount. I’m going to have a sale Saturday and Sunday, August 15-16, from 11am-3pm. It’s cash only." Show up at 918 West Montrose (the former Dearborn Wholesale Foods, across Montrose from Jewel, and yes, there's a parking lot) on Saturday or Sunday to take advantage of this sale.